I guess you could say I have Georgia on my mind. It makes sense considering I was in Atlanta last weekend for BlogHer Food. Now, I could use this space to discuss the actual event, but I don’t think it is necessary. So many bloggers have posted their thoughts, Linda and Dianne for example, and I would rather share with you a craving that is directly linked to the conference. During lunch on the first day we were served what can best be described as flabby hotel buffet food. I suppose it came with the price of hosting the event at the hotel … that can be the only reason they served it to us. 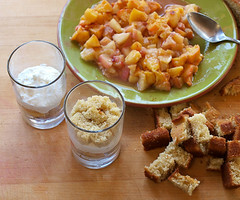 On the dessert table there was a dish there that they called peach cobbler. 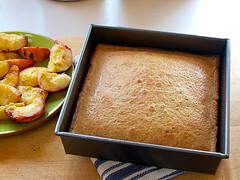 It was mushy, bland, processed peaches topped with a soggy crust. It made me sad in my heart, and I decided that when I returned home I would make a dish that treated the peach with the respect it deserves. Peaches are my favorite fruit, but I only eat them when they are in season. 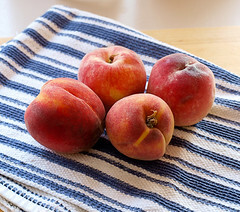 Yes, you CAN get peaches in the fall and winter, but they are hard, sour, and bland. I prefer to wait and enjoy the robust peaches that can only be had when the weather turns warm. 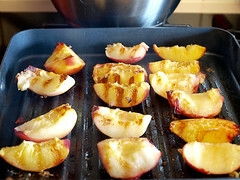 Knowing peaches were the star I decided to prepare them in my favorite way – on the grill. 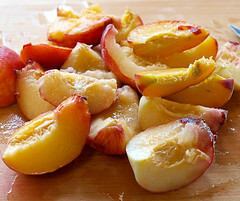 Grilling peaches gives them a soft, lush texture and punches up the natural sweetness. Next I made a moist, buttery vanilla cake with a hint of cardamom. Cardamom gives the cake a subtle floral aroma that pairs well with the peaches. To add another layer of flavor I made golden syrup whipped cream. The caramel notes of the golden syrup give the whipped cream sweetness with out being cloying. 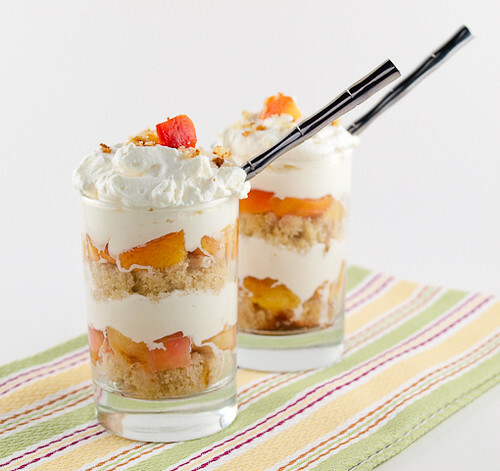 This dessert can be served right away, but, if you can be patient, a few hours in the refrigerator will allow the peachy juices to soak into the cake. Trust me, you want that. Heat the oven to 350 F and spray an 8-inch square pan with non-stick cooking spray. 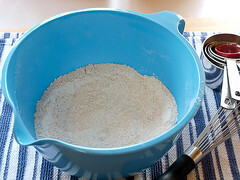 In a medium bowl combine the flour, baking powder, baking soda, salt, sugar, brown sugar, cardamom, and vanilla beans until well combined. 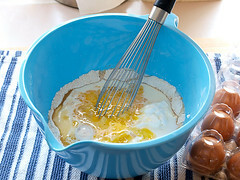 Add the butter, milk, sour cream, and beaten egg and whisk until the batter only has a few small lumps remaining. 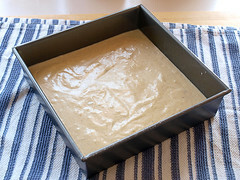 Pour the batter into the prepared pan and bake for 25 to 30 minutes, or until the cake pulls away from the sides of the pan and springs back when gently pressed in the center. Allow to cool for 10 minutes in the pan then turn out onto a wire rack to cool completely. While the cake is baking prepare the peaches. Slices the peaches into quarters and remove the pit. Place the peaches in a medium bowl and add the sugar. Toss to coat. Heat the grill to medium heat and spray with non-stick cooking spray. Once hot place the peaches on the grill and cook for 2 to 3 minutes per side, or until the peaches are starting to soften and have light grill marks. 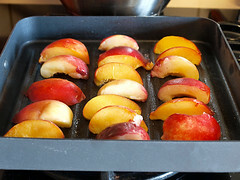 Once grilled allow the peaches to cool to room temperature before removing the skins and roughly dicing the fruit. Once grilled the skins should slip off easily. Next, prepare the whipped cream. In the work bowl of a stand mixer combine the cream, golden syrup, powdered sugar, and vanilla. Whip on low speed until frothy then increase the speed to medium high and whip until the cream forms medium peaks. To assemble the trifle begin by cutting the cake into cubes. The size of the cubes will depend on what you serve the trifle in. For a large dish cut the cake into 1-inch cubes, for individual containers cut the cake into 1/2-inch cubes. 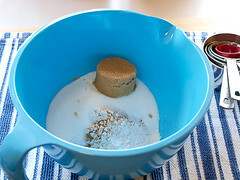 Begin by placing a layer of cake in the bottom of the dish. 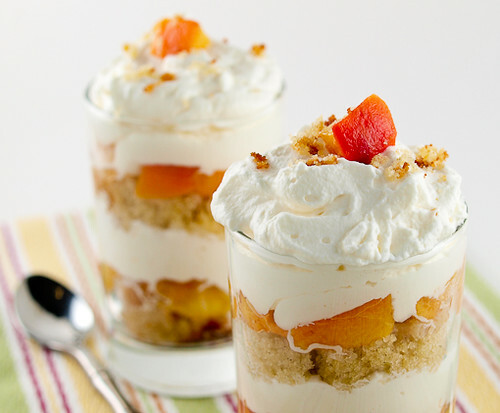 Next add a layer of peaches, then top with a layer of whipped cream. 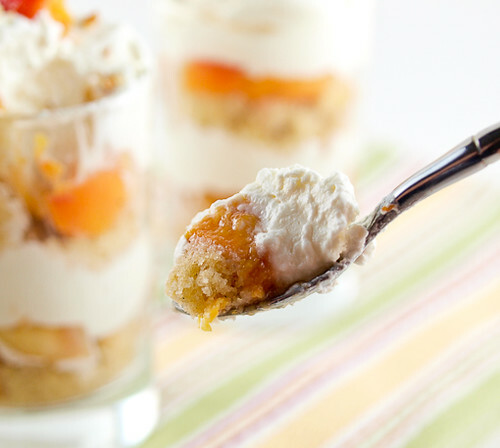 Repeat, ending with the whipped cream. 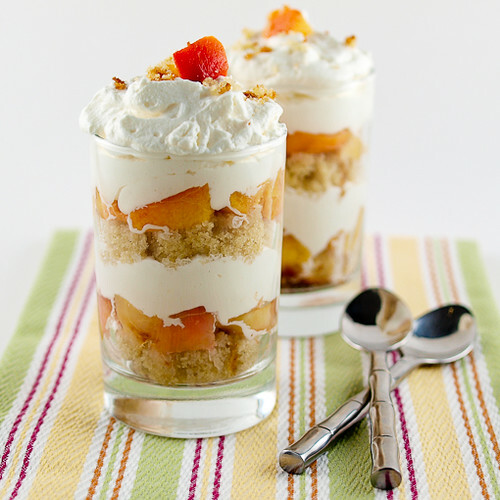 Garnish the top of the trifle with cake crumbs and a few pieces of peach, if desired.